Yesterday at work we said goodbye to the Latte Lounge. Our office was testing it out this week. Friday was its last day with us, and I can already feel that it’s made a change all our lives. The Latte Lounge is a remarkable little machine. Actually, it’s enormous. It must outweigh our old coffee maker 10 to 1. It stood in an underused part of the first floor like a robotic guard watching over the adjacent vending machines. Today is the birthday of my cube mate at work. When I arrived this morning, she alerted me to an Irish whiskey cake she had made and brought to the morning news meeting. “Better go downstairs and get some while it’s still there,” she said. It was getting rave reviews around the office. “It’s like you bought it at the store,” someone said. “I made it without eggs and without milk,” she said. “You made a cake for your own birthday?” I asked. My office conducted its second annual bake-off last week. As if a bake-off isn’t gay enough, ours is now annual. And it inspires some fierce competition. Last year we had two teams. It was the programming department versus the online production department. This year, we had so many people take interest that there were three teams. That’s me in the back of the second team, striking the Charlie’s Angels pose with an electric mixer. This is what gay cable networks get up to when no one is looking — in case you were wondering. I wonder what Bravo does. The rules are simple: We are each to make a sweet dessert, each one containing at least three ingredients and yielding at least 15 servings. And we must bring out own serving implements. The entire staff may vote once for the desserts they think are the best in three categories: Gayest, Most Original and Outrageous, and Best Overall. The team with the most accumulated points among its members wins. My boss and I teamed up last year to win the Best Overall with deep-fried apple pies. He made the dough, and I made the filling and schlepped the deep-fryer. And our team won. So this year it was a grudge match for Programming. I briefly considered some heinous concoction or other from a ’50s-era, Good Housekeeping, Lutheran church basement pot-luck social cookbook. Something with lime Jell-O, marshmallows, cottage cheese and mustard. Or something. But the online department had a theme: All our desserts were to contain some sort of booze. We called ourselves Alco-Locas, our not-subtle tribute to Nina Flowers. Grasshopper brownies with creme de menthe seemed a bit more palatable, but it didn’t seem gay enough. I wanted something a bit more fancy-pants and challenging. So I settled on a friend’s suggestion, Lillet-flavored marshmallows. 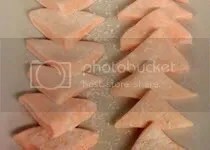 For shits and giggles I made them pink and cut them into triangles. How gay can you get? Apparently it wasn’t gay enough. A chocolate-and-nut confection rolled in coconut won Gayest. Yummy Balls they were called. How coarse! Can you believe it? Over pink marshmallow triangles — flavored with a French wine aperitif! Well, I have to hand it to my proud and worthy competitor for a well-named dessert. People just couldn’t get enough of his balls. So many people had his balls in their mouth that day. Coworkers would ask each other if they’d had his balls yet. Here are a few of the notable competitors. 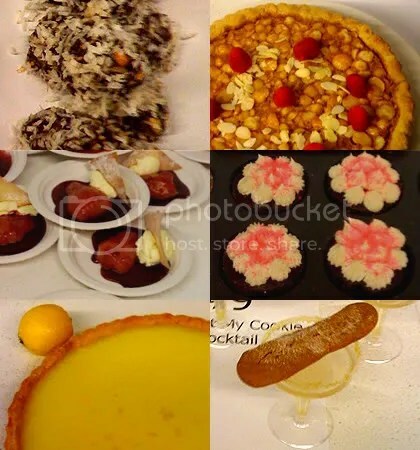 From top left, clockwise: Yummy Balls, Macadamia Nut Pie, 80-Proof Irish Car Bomb Gay-teaux, Eat My Cookie Cocktail, Tarte au Citron, Poached Pears in Red Wine with Lime Mousse. Team 3, “Sons of Batches,” won in a delicious upset with the most accumulated points. But the Programming department had the most individual winning desserts. And Online… well, let’s just say we got served. Most Original and Outrageous went to a dessert involving a ginger-sugar rimmed champagne-ginger cocktail and a gingersnap. The Eat My Cookie Cocktail. Yes, it was very ginger. Very precious. Like me, its maker was disappointed he didn’t get Gayest. But I do absolutely think he deserves the title he got. I’m already studying up for next year. I can see I’m gonna have to pull out the big guns. It’s gonna involve fire. Baked Alaska? Cherries Jubilee, anyone? Walking to my office from the last Manhattan F train stop before Brooklyn, I felt like I could imagine what the old Lower East Side was. Or maybe what it always has been — and always will be. A neighborhood of immigrants. The home of the undervalued and overwhelmed. The social service agency where I worked was located on the eastern edge of ever-eastward-expanding Chinatown. The area is still brimming with unassimilated culture, but the immigrants these days are the young white folks from uptown, adding their soy latte paper cups and Whole Foods plastic bags to the polystyrene clam shells and broken liquor bottles of previous inhabitants’ detritus. Every morning along East Broadway I passed several of the small food distribution warehouses that supply the innumerable restaurants in the area. It’s all rubber tires and wooden palettes, beeping carts and honking horns, orders barked in Chinese and answered in Spanish. Lazy, unaffected stray cats lounge on bags of rice. Cases of five-gallon jugs of monosodium glutamate wait, cooling in the early shade. Bags of overripe onions and packs of bean sprouts sit waiting for refrigeration, sending into the air a spoiled, acrid bouquet of lost time. Waxed cardboard boxes of chicken parts drip quietly inches above the pavement. Oil and bile and festering water from thawing seafood mix with milky pools of unidentifiables in the streets. The draught, gently, blindly finding its way toward the pungent gutters, never frozen in winter, never quick in summer, would glisten in the sharp early sun of crisp fall mornings, would stir cigarette butts slowly in shades of gray and beige in the murky mornings of springtime. God knows what time these poor guys got out of bed to haul crates, push carts, load vans. They’d have been at it for hours before I passed by at 8:30 in the morning. I’d avoid the puddles, careful not to slip, hopping to one side then the other to miss skillful dollies and swiftly moving carts, pressing onward toward the warming day to a place I had the nerve to complain about.